A reader sent me the following links which some may be interested in. It relates to Fr. Lang's book and the issue of freestanding altars and versus populum. The Latin does not say that celebrations versus populum are desirable. It says that separation of the altar from the wall is desirable (or useful or fitting) wherever possible. A reader sent in the following liturgical chart which looks at the Latin texts of eight historical rites of the Latin church, the Roman, Ambrosian, Rite of Lyons, Rite of Braga, Carthusian, Carmelite, Dominican and Mozarabic. It's a well done chart and a good resource. Thanks to John R. for sending this in. When David encourages everyone “to bless his holy name,” what does this really mean? It means David is calling on himself, and on all of us, to bless, to praise, to worship God, because he “redeems” our lives — he gives life, not death. But how do we bless God, praise him, worship him? And what is the best way to do this? This is a problem because holiness, “being holy,” is the essential attribute of God; holiness is his glory, his majesty, his eternity, his very essence and life. But precisely because God alone is holy, his holiness is the source of a separateness, a distance from us. So how do we approach him, even to worship him? The preliminary, striking conclusion is that the problem of orthodoxy, the problem of the right worship of God, is by definition a liturgical problem. What I am saying is that the problem of orthodoxy, the problem of praising God, is the central problem Benedict must face in his pontificate, and this means the central problem has a liturgical aspect. But to say the problem is “liturgical” is not to set it on the margin of things. No, it is to set the liturgical problem at the center of our culture, as the determining problem for the future of “the Christian West” (though “the West,” as Benedict suggested when he recently dropped the title “Patriarch of the West” from his list of titles, has been made obsolete by modern technology — air travel, satellites, the internet — in the process of “globalization”). I say this because “right worship” (“orthodoxy”) sets men and women in a right relationship with the single being worthy of human worship, the “all-holy” divinity, and in so doing establishes them in a right relationship with one another. Because this is so, “right worship” is, in the most profound sense, also a political matter. Without going very deeply into this question, it is enough to say that “right worship,” just as it can sustain a man or a woman in the solitude of prison, or in a concentration camp, or through periods of intense suffering, so too it can be a central protection for freedom in our political life, because no political leader, no emperor, no ideology, can claim our “worship” if we know we must worship God alone. In this sense, “right worship” is always a limitation on totalitarianism, whether it be from the left or from the right or from any other direction on the compass. In this sense, Pope Benedict’s action to protect, preserve and promote the liturgy, to protect “right worship,” will be his religious duty, but also a supremely — I would say “sublimely” — political act. It will not be evidently political in the way John Paul II’s support of Solidarnosc was. But Benedict’s work to restore “right worship” will be the work of a Christian and a theologian and a bishop of Rome profoundly aware not only of the spiritual crisis of our age, but of its political crisis as well. In a Europe threatened by two advancing, non-Christian cultures and systems of thought — liberal secular humanism, which seems destined to impose a new despotism of relativism in a vain search for liberty without the holy, freedom without God, and Islam, which preaches a God who never was and could not ever be incarnate in a man — only a radical return to Christian orthodoxy, that is, to right worship, can protect the very values that both of these traditions, at their best, espouse: the dignity of man, and the transcendence of God. ROME (CNS) -- Liturgical changes implemented after the Second Vatican Council could be perfected, said the new secretary of the Congregation for Divine Worship and the Sacraments. No one is in favor of making changes for the sake of change or even for nostalgia, said Archbishop Albert Malcolm Ranjith Patabendige Don, the secretary, during an April 27 discussion about the direction the priest faces during Mass. The discussion coincided with the publication of the Italian translation of Father Uwe Michael Lang's book, "Turning Towards the Lord: Orientation in Liturgical Prayer." The book previously was published in English by Ignatius Press; the text includes a foreword written in 2003 by then-Cardinal Joseph Ratzinger. The cardinal, who has since become pope, said that the Second Vatican Council did not mention the direction the priest faces and the post-conciliar documents only recommended that priests be able to celebrate facing the people. He wrote that the issue was not over a priest celebrating "with his back to the people," but rather "his facing the same direction as the people" when offering the church's most solemn prayer in consecrating the Eucharist. At the book presentation, Father Lang said his study focused on the history and theology of the priest facing East -- the biblically symbolic direction of the Lord -- and not on the pre- or post-Vatican II liturgy. "The idea of my book is to demonstrate that the priest is not turning his back on the people, but leading the people in prayer toward the Lord," he said. 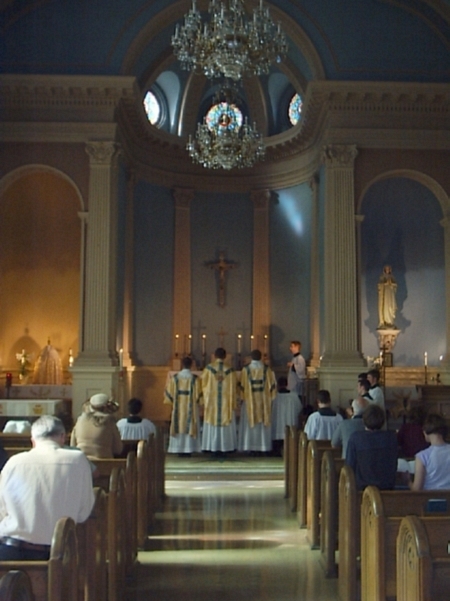 "I think it would be a good idea to reintroduce this idea into the liturgy little by little, without a great revolution," he said, adding that he was speaking only about the moments during the Mass when the priest, on behalf of the people, is praying to God, not when he is addressing the people assembled. Archbishop Patabendige Don was asked if Pope Benedict had ordered a study of the issue or if the congregation was moving in that direction. "For the moment," the archbishop said, "there is nothing, but we listen to the opinions and experience of people who are interested in these questions." While Archbishop Patabendige Don said he was convinced Catholics need help recovering the sense of mystery and of God's transcendence in the liturgy, careful study is needed on specific ideas. "Things done in a hurry tend not to give the hoped-for results," he said. Above all, the archbishop said, Catholics must engage in study and discussion in a calm, respectful and prayerful atmosphere "without labeling each other" as traditionalists or radicals. Archbishop Patabendige Don said he does not necessarily agree with people who call for a "reform of the reform" of the liturgy, but he thinks Father Lang's book contains a valid call "at least for a further perfection of the reform." I know there are some French language readers out there. Some of you will likely be interested in this ROTR (reform of the reform) site in France which is dedicated to helping bring Latin and Chant back into the modern Roman liturgy. Rome, Apr. 27 (CWNews.com) - The Italian publication of a book on the liturgy, with a preface by Pope Benedict XVI (bio - news), is calling fresh attention to the Pope's interest in liturgical reform, and particularly in recovering the elements of the traditional Latin liturgy. The Italian publisher Cantagalli held a public presentation on April 27 to introduce Rivolti al Signore, a book written in 2003 by Father Uwe Michael Lang, with a preface by then-Cardinal Joseph Ratzinger. 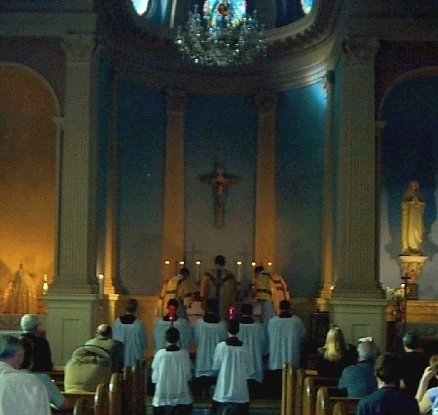 In the book, Father Lang argues in favor of celebrating Mass ad orientem-- that is, with the priest and the congregation facing in the same direction. Rivolti al Signore appeared in English as Turning Towards the Lord, published by Ignatius Press in 2004. Apr. 26 (CWNews.com) - The head of the traditionalist Society of St. Pius X has pressed his case for a re-examination of Vatican II teachings, in an interview with the French magazine Famille Chrétienne. Bishop Bernard Fellay told the French publication that he retained his hope that Pope Benedict XVI (bio - news) will allow broader use of the old Latin Mass. "Opening the doors to the old liturgy would probably be the most fruitful way to resolve the crisis in the Church," he said. The leader of the SSPX, which broke from Rome in 1988, said that he would be slow to form a firm opinion about the leadership of Pope Benedict XVI. "We need action," he said; "words are not the important thing." Bishop Fellay told Famille Chrétienne that although he and the Pope found a good deal of common ground for discussion, they continue to take very different views regarding Vatican II. While acknowledging that Pope Benedict has said that the Council teachings must be interpreted in the light of Catholic tradition, the bishop said that he would go further. "We propose to get beyond the Council," he said, "looking higher, toward principles that cannot become outdated because they are eternal." Ad Orientem: The Tridentine Mass: Why do the Orthodox care? The blog Ad Orientem has a piece up in response to an NLM reader, The Tridentine Mass: Why do the Orthodox care? The full piece is available above, but I've chosen to paste in below the answer to the question posed. It is interesting to read, because in trying to ascertain answers to the "liturgical question", I think it helps to see how another apostolic church perceives the situation, and perceives the present liturgical state, as well as the liturgical heritage, of the Latin rite. "In general the level of interest in the matter, on our side of the fence, is not altogether widespread. It exist primarily in a few subgroups such as liturgists, former Catholics and some members of the clergy. Many Orthodox are completely unaware of the controversy and some, if they were aware, would tell you they had zero interest in what the Catholic Church does. However many Orthodox do grasp that (like it or not) what Rome does is important. Orthodox liturgists have always tended to cringe at the reforms of the Latin Church post Vatican II. There are a number of reasons for this. "First and foremost, Orthodoxy is institutionally suspicious of change. If your changing something the first question from an Orthodox will be "why?" "If it aint broke, don't fix it" could be our motto. Orthodox (who have a clue about these things) can look at the rite of +Pius V and see the pre-schism liturgies of Pope St. Gregory the Great and of St. Peter, less a few add on's that we do not accept like the Filioque and references to the merits of the saints etc. But substantially it's the Gregorian Liturgy of the Orthodox West. By contrast the reformed liturgy of +Paul VI is a radical departure from the liturgical traditions of the past. Even in Orthodoxy some things change. But it's always a very slow gradual change. Organic development in liturgy is permissible. Radical invention is not. The Pauline liturgy implicitly seems to move away from the clear expressions of faith about the sacramental nature of the Divine Liturgy commonly understood in the undivided church of the first millennium. "If you look at the rites employed in Orthodox parishes that follow the Western Rite (yes we have some), none use anything resembling the Novus Ordo. The liturgical rites most commonly employed by Western Rite Orthodox are the Liturgy of Pope St. Gregory the Great and the Liturgy of St. Tikhon. The former is a corrected form of the Pian Missal, and the latter is a corrected form of the High Church Anglican BCP of 1892. They are typically employed by the Western Rite Vicarate (WRV) of the Antiochan Orthodox Archdiocese. The other liturgy employed is the Use of Sarum which is the ancient liturgical rite of parts of pre-schism Britain. This is typically used by parishes under the Russian Orthodox Church Outside of Russia (ROCOR) and some Old Calendarist sects (although there are some minor differences between the rites used by ROCOR and the Old Calendarists). "As you may be aware there is a fairly lively debate going on within Orthodoxy as to whether or not the Roman Catholic Church retains the grace of valid sacraments (we use the word mysteries). The radical changes in the Latin Rite have been cited by some as evidence of the lack of grace in Catholic sacraments. I do not personally subscribe to this. But I do think as an indication of how seriously the changes in the western rites are taken, that it was in 1973 the ROCOR issued it's decree that it would no longer accept the validity of Catholic baptisms in contravention of the immemorial practice of the Russian Church. 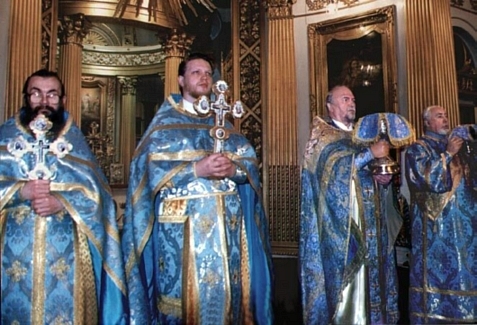 Today Roman Catholics (and pretty much everyone else) converting into Orthodoxy via ROCOR must be baptized. "A restoration of the so called Tridentine Rite in the Roman Catholic Church would probably be helpful. It's something that Orthodox can look at and say "we recognize this." The theological chaos now engulfing the Christian West is one of the more alarming things which we see in the modern world. As ongoing discussions about other issues move forward this could have a positive impact on the West's sensus fidei which we perceive as having been horribly compromised in recent decades. Orthodoxy remembers that the West was once part of the undivided church. And as St. John Maximovitch said "... Her venerable liturgies are far older than any of Her heresies." The same story mentioned above is available in a different report atCatholic World News under the title: Tradition is focus for papal audience. Vatican, Apr. 26 (CWNews.com) - Pope Benedict XVI (bio - news) offered a brief explanation for the authority of tradition in the Church, at his regular weekly public audience on April 26. Speaking to a large crowd of about 50,000 people in St. Peter's Square, the Pope said that tradition is "not just a material transmission" of ideas passed down from the apostles, but "the permanent presence of the Savior," who continues to guide the Church through the power of the Holy Spirit. Vatican City, Apr. 26, 2006 (CNA) - Speaking to a crowd of over 50,000 gathered in St. Peter’s Square, Pope Benedict XVI used the occasion of his regular Wednesday audience to expound on the idea of apostolic tradition, saying that the Church relies not only on material information passed down through the centuries, but on the effective presence of Jesus himself. The Pope based his audience on the subject of Ecclesial communion as well as the broader concept of tradition. "Ecclesial communion”, which is “aroused and sustained by the Holy Spirit, [and] safeguarded and promoted by the apostolic ministry - does not only extend to the believers of a particular historical period, but embraces all times and generations," said the Pope. The Holy Father likewise stressed that “This transmission of the 'things' of salvation is what constitutes the apostolic tradition of the Church." The Holy Spirit "actualizes the salvific presence of the Lord Jesus, through the ministry of the apostles ... and through the entire life of the people of the new covenant." This commonly used term, he clarified, “is not just a material transmission of what was originally given to the Apostles, but the effective presence of the Lord Jesus ... Who, in the Spirit, accompanies and guides the community He gathered." “It is”, he said, “the organic continuity of the Church, ... the permanent presence of the Savior Who comes out to meet, redeem and sanctify us in the Spirit." Speaking of Eastern Christian worship, I happened across Liturgy.ru today which has some interesting resources on the liturgy of the Russian church, as well as some spectacular images. Nairobi, Apr. 25 (CWNews.com) - Catholic Church officials in Kenya has launched a revised hymnal, in an effort to standardize music used in the Mass. The book, known as Tumshangilie ('Let's Praise Him' in the Kiswahili language) is the product of 10 years of work. The revision of the first edition of the hymnal was done under the direction of Father Peter Meinberg, OSB. Kenyan bishops have expressed some concern about the varieties of music and liturgical dance that have been used in the liturgy. Bishop Peter Kihara, who chairs the liturgy commission for the Kenyan bishops' conference, said that the revised hymnal should ensure that the appropriate music is used in Eucharistic liturgies. 'The music should be aligned with the doctrine and the liturgy of the Catholic Church,' the bishop told the Daily Nation. 'There have been cases where choir masters and composers have come up with all sorts of music which tended to be a disgrace to the Catholic faith.' "
Thanks to an NLM Reader, John, for pointing out this video clip showing a part of the Ethiopian Orthodox Divine Liturgy. "The Ethiopian liturgy is of Alexandrian (Coptic) origin and influenced by the Syriac tradition. The liturgy was always celebrated in the ancient Ge’ez language until very recent times. Today a translation of the liturgy into modern Amharic is being used increasingly in the parishes. A strong monastic tradition continues." "This church is unique in retaining several Jewish practices such as circumcision and the observance of dietary laws and Saturday as well as Sunday sabbath. This is probably due to the fact that the earliest presence of Christianity in Ethiopia had come directly from Palestine through southern Arabia. But there is a tradition that Judaism was practiced by some Ethiopians even before the arrival of Christianity. There have also been some unusual christological developments, including a school of thought that holds that the union of Christ’s divine and human natures took place only upon his anointing at Baptism. These teachings were never officially adopted and have mostly died out." There is also an Ethiopian Catholic Church. Apr. 21 (CWNews.com) - During a closed-door meeting on March 23 with the College of Cardinals, Pope Benedict XVI indicated that he plans a move to allow broader use of the old Latin Mass. The exact nature of the Pope's move, and its timing, remain matters of intense speculation. As the French bishops concluded their annual assembly on April 7, Cardinal Jean-Pierre Ricard revealed that the Pope is expected to issue directives "in the coming weeks or months" that would appeal to traditionalist Catholics. The French cardinal confirmed that Pope Benedict is particularly anxious to find ways of restoring normal relations with the Society of St. Pius X (SSPX). As prefect of the Congregation for the Doctrine of the Faith, then-Cardinal Ratzinger was closely involved in the efforts-- ultimately fruitless-- to avoid a breach between the late Archbishop Marcel Lefebvre's traditionalist group and the Vatican. In June 1988 the archbishop consecrated four bishops, against explicit orders from the Holy See, and the Vatican responded with a decree of excommunication. Since that time the Vatican has maintained contact with the breakaway traditionalist group, looking toward a restoration of normal ecclesiastical ties. Talks between SSPX leaders and Vatican officials became more intense in the Jubilee Year 2000, at the explicit request of Pope John Paul II; the efforts have been stepped up again under Pope Benedict XVI. The new Pope has always been perceived by traditionalist Catholics as a sympathetic friend, and his private meeting last August with Bishop Bernard Fellay, the SSPX superior, was seen as an important step toward reconciliation. For several weeks, at the Pope's request, Vatican officials have been discussing proposals for the reintegration of the SSPX into the normal structure of the Church. After the March 23 meeting of the world's cardinals, Cardinal Dario Castrillon Hoyos-- who as president of the Ecclesia Dei commission has been the Vatican's leading figure in talks with traditionalists-- said that the Church would welcome back the Lefebvrists "with open arms." The day's discussions, the Colombian cardinal said, had involved a search for "the best formula" for a canonical resolution of the split. For the past month, a recurrent rumor at the Vatican has been that Pope Benedict will issue a motu proprio allowing the universal use of the 1962 Roman Missal. (The use of the old rite is currently allowed only with the approval of the diocesan bishop, under the terms of the 1988 papal directive Ecclesia Dei, from which the Vatican commission draws its name.) Reports have also suggested that the Vatican is prepared to lift the decrees of excommunication against the SSPX leaders. And there have been reports that the Holy See could create a new ecclesiastical unit, an apostolic administration of personal prelature, for the pastoral care of traditionalist Catholics. However both the Vatican and the Lefebvrist group have listed conditions that must be met before reconciliation is possible. The Vatican insists that the SSPX leaders manifest their repentance for the break with Rome, and accept the validity of Vatican II documents. 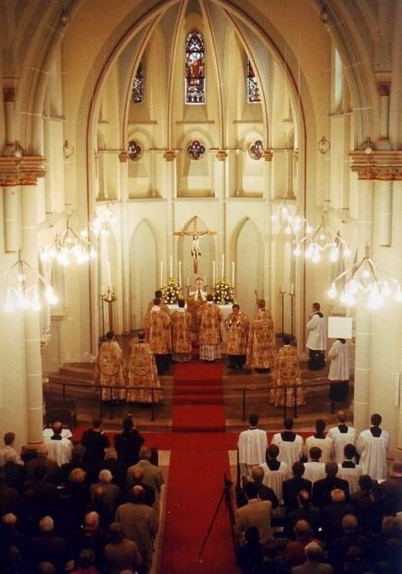 The SSPX demands a Vatican move allowing free worldwide use of the old Latin Mass, and the freedom to question the content of some Vatican II documents. A motu proprio allowing unrestricted use of the Tridentine rite would fulfill the first SSPX request. Last December, in a pre-Christmas address to the Roman Curia, Pope Benedict emphasized that the documents of Vatican II must be interpreted in the light of Church tradition-- a statement that went a long way toward satisfying the other traditionalist demand. While Pope Benedict is clearly hoping to restore full communion, it remains unclear how many members of the SSPX are equally anxious to repair ties with Rome. Some Lefebvrists have indicated a strong desire to resolve their disagreements with the Holy See; others, such as Bishop Richard Williamson, have suggested that there is no realistic prospect for agreement with a Vatican leadership they regard as thoroughly corrupt. Bishop Fellay-- probably hoping to hold the different factions together, as the SSPX moves toward a July leadership vote-- has allowed that the Vatican seems anxious to move toward reconciliation faster than his own followers are ready to go. Given that the Church Music Association of America has no advertising budget, but still needs to alert people to the existence of its colloquium this summer, I wonder if this little ad would be compelling enough for people to link on their sites and blogs. Opinions? Compelling? Silly? I don't want to make a big deal of this, but I've had a few readers of the NLM recently asking about whether they can make donations to the NLM. Now, this blog is an apostolate pure and simple. It's done out of love for the Church and the liturgy, not for personal gain. That being said, if someone wanted to make a donation, that's up to them, and I've decided to provide a "Paypal Donate" button in the sidebar. Any donations would be used toward some liturgical conference or resource of benefit to the NLM readership. Also, some readers may not know that I also have a used Catholic books section available with various liturgy related books and general Catholica. Some of these are my own that I am selling, others that of a Catholic bookseller friend. Take a look if you're interested. 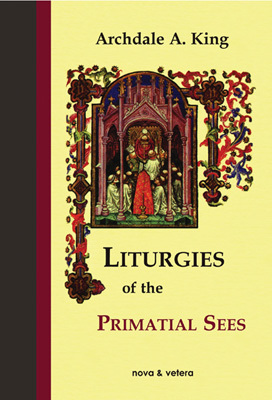 I have the extreme pleasure to more formally introduce readers of the New Liturgical Movement with two recently re-published, classic liturgical studies – a very much overdue reprinting by most any account. Archdale King originally published these books back in the mid 1950's. Besides these two titles, he also published other liturgical studies, such as Liturgies of the Past, The Liturgy of the Roman Church, and The Rites of Eastern Christendom. There is an increasing interest these days in legitimate liturgical diversity. Not liturgical diversity in the sense of "do-it-yourself" liturgy, but in the sense of traditional variances in liturgical books, ceremonial and custom. While this legitimate diversity has always been a part of our Catholic heritage, it has become something quite abstract to most Latin rite Catholics. Many are astonished when they learn of the Eastern liturgical rites for the first time. Some, on the other hand, are aware of the liturgical diversity that exists within the Christian East, however, such diversity within the Latin rite is less known. In the years following the Second Vatican Council, many of our liturgical traditions were sadly set aside; not because of Church decree, but rather because of a spirit which deemed them no longer desirable or relevant to modern man. Part in parcel with this attitude was the development of an undesirable form of diversity; one which gives great freedom on the one hand (where novelty and innovation is concerned) but which is extraordinarily stingy about diversity on the other hand (where tradition is concerned). The positive effect which has come in response to this undesirable situation is that many have sought to understand what constitutes true liturgical diversity and are more and more seeking out information about the riches of our tradition. In so doing, many have gained a new appreciation for the rich tapestry that is the Western liturgical tradition. This laudable and fruitful effort can find little better resource than Archdale King's two books, Liturgies of the Religious Orders and Liturgies of the Primatial Sees. Perhaps of most interest today – perhaps due to an interest in a monastic and specifically Benedictine revival of Christian culture in Europe and the West generally – are the so-called monastic rites. "Each of the chapters contains a brief sketch of the Order under consideration; some account of the churches built for its liturgical worship; a history of the origins and development of that rite; the liturgical year; chant; ornaments of the church and ministers; and, finally, the rite as it appears today, in both formulas and ceremonies, with, as far as is possible, the story of their beginnings, and showing in what particulars they differ from the Roman rite as exemplified in the Pian missal." In Liturgies of the Primatial Sees we are taken through four rites: the rite of Lyons, the rite of Braga (with an appendix on the rite of Tibaes), the rite of Milan (or, as it is better known, the Ambrosian rite) and the rite of Toledo (or, the Mozarabic rite). Archdale King's approach to these rites is precisely the same as the approach he described just above. The level of detail to be found in both books cannot be understated. In fact, each rite itself could merit its own lengthy review. Suffice it to say, it is my hope to simply give potential readers a sense of the scope and contents of the books. A few words about the structure of the books. These are scholarly books, and as such they include typical features and characteristics of such works, such as the use of liturgical and eccelsiastical vocabulary. Moreover, many of the Latin language references aren't translated. In both cases however, readers will not find this insurmountable. Most who have any interest in this level of liturgical detail and history will already have the basic vocabulary down. As for the Latin references, these passages tend to be short, either a sentence or even a phrase, and the sense of them is given by Archdale King himself -- which, for most, will be more than sufficient. Both books are also furnished with a number of black and white plates. These plates vary from architectural images of the interior and exterior of the churches, to, most interestingly, images of the actual vesture and ceremonial of the various liturgical rites in question. As well, extensive bibliographies are to be found within each of the books. Particularly handy, however, is the fact that these bibliographies are put at the end of each section on the particular liturgical rite in question. This makes it quite easy to look up particular resources for particular rites. In addition, as part of this academic apparatus, extensive indices are available at the back of each book. The books are priced at $85/105 USD each. While that might seem steep it must be remembered that these are true reference volumes, and on a topic which is not only of high value and interest, but also rare. Prior to Nova et Vetera republishing these books, the original volumes from the 1950's would typically run around $200 or more in the used book circuit, normally coming from seminary libraries. If you need any more encouragement, the more of these volumes they sell, the greater the likelihood we may be blessed to see more of Archdale King's works come back into print. But they won't stay in print forever, so I'd suggest that if you have the means and you have the interest that you purchase these two works before they are gone again. The books may be ordered either directly from Nove et Vetera in Germany, or St. Philips Books, Oxford, England. So what if Benedict isn’t really interested in either going back to the Tridentine Mass, but is really more interested in returning to 1962, in a sense, and bringing forth a reform of the liturgy that is an organic development? It's an interesting piece and I wish to comment on it. I think Mr. Bettinelli has it partially right here, but I wish to round out what he's said with some comments of my own. I believe the basic thrust that Mr. Bettinelli is getting at is that Pope Benedict may have in mind, primarily, that he wishes to reform the reform and he will use the "Tridentine" books to help accomplish this end. Thus, his end is not the Tridentine books per se, but rather the reform of the post-conciliar liturgy. I think those of us with a good familiarity of Pope Benedict's liturgical thinking certainly understand that the Holy Father isn't trying to simply turn back the clock and replace the 1970 Missal with that of 1962 in some carte blanche fashion. What he is more likely trying to turn back the clock on is an approach toward the liturgy which finds its modus operandi in the artificial world of committees and editors rather the natural (and traditional) liturgical world of organic development. Moreover, he wishes to combat two views at two ends of the spectrum: that of the Church having begun at the Second Vatican Council (the progressivist-dissenter view), and that of the Church having ended at the Second Vatican Council (the hardline-traditionalist view). In other words, he wishes to promote that hermeneutic of continuity he has spoken of. In short, that tradition and continuity must gain pride of place again; not rupture and novelty. As regards the liturgical question then, clearly the Holy Father is for a reform of the reform. Why wouldn't he be after all? In the Latin rite, it is the rite which most Catholics worship in. And after all, as Cardinal, he was considered a kind of spiritual father of the reform of the reform movement. So how does that leave things for the classical Roman liturgy? It seems to me that if there is anything the Holy Father has shown himself to be it is a highly nuanced thinker. One who holds fast in matters that must be held fast to, but who seems able and willing to look where our tradition of legitimate diversity might be applied and flexed; he is one, I think, whom considers precisely how we have gotten into the situation we are now faced with today and the corresponding pastoral realities we must now deal with. Cardinal Ratzinger, and presumably Pope Benedict, has shown immense love, tolerance and support for both the reform of the reform and classical liturgical movement. Part of this, of course, could indeed be because of the role the classical liturgy can play as a point of reference, and, additionally as an aid to restoring Catholic worship in general in the post-conciliar Latin rite. But there seems to be more behind it than that. I certainly have no sense that the classical liturgy is understood by him only as a temporary tool, a means to an end, for the purpose of the reform of the reform and nothing else. Pastorally speaking, it is hard to imagine someone with such evident pastoral concern for his flock, and with such a good history with these communities (communities, let us remember, made up of young families, seminarians, religious and priests; of parishes, seminaries, monasteries and lay associations), would relegate them in such a way - let's recall it was he who said that those attached to the classical liturgical books are often treated like lepers. It would seem in contradiction to his words and actions, if not also his genuine pastoral concern. Frankly, I think no one, the Holy Father included, really feels that they know what will transpire in the future. There are many factors and we're dealing with many souls on all sides. Will there be a two variants on the Roman missal or will they eventually converge? It's hard to say. In the here and now the Holy Father has demonstrated himself as a man who is sensitive to both tasks and the pastoral realities facing each side. Ultimately, whatever happens in the future will happen beyond Benedict's time. For now it would seem plausible that he wants to kick off the reform of the reform as best he can, and also give as wide and generous an availability to the classical liturgical communities as possible. To that end, I believe the Holy Father approaches this question as a "both-and" issue. Where we end up in 40 or 50 years will remain to be seen and perhaps he is content to leave that to the Holy Spirit. Vatican, Apr. 21 (CWNews.com) - An influential Vatican prelate has expressed cautious optimism about the prospects for an eventual restoration of full communion between the Holy See and the traditionalist Society of St. Pius X (SSPX). Cardinal Jorge Medina Estevez, the former prefect of the Congregation for Divine Worship, told the I Media news agency that Pope Benedict XVI (bio - news) is keenly interested in restoring normal ties with the Lefebvrist group, and confirmed that the topic was discussed at length during a March 23 meeting of the College of Cardinals. The Chilean cardinal, who is a member of the Ecclesia Dei commission charged with pastoral outreach to traditionalist Catholics, told I Media that the Tridentine form of the Mass "was never abrogated." The use of the old rite "is consequently legitimate," he said, although "it seems necessary to me have maintain some norms for the good order of liturgical life in the dioceses." During their March 23 meeting, Cardinal Medina said, the cardinals spoke about offering "a generous welcome" to Catholics who prefer the Latin Mass, under the terms of the 1988 papal document Ecclesia Dei. He said that the conversation had centered on the Catholics who have maintained full communion with the Holy See, rather than with the SSPX. The status of the Lefebvrist group is quite different, the cardinal pointed out, since the SSPX broke with Rome in 1988. Questioned about the penalty of excommunication that was incurred by the late Archbishop Marcel Lefebvre and the bishops he ordained in June 1988, Cardinal Medina Estevez observed that the penalty could certainly be lifted. "Excommunication is a canonical penalty," he said, "whose aim is the repentance of someone who has committed a serious offense." When that individual shows repentance and a desire to amend matters, he said, the penalty can be lifted. Cardinal Medina Estevez said that he saw different tendencies within the SSPX, with some members of the traditionalist group anxious to restore ties with Rome, and others more recalcitrant. "Perhaps the majority hope for full communion with the Holy See," he said hopefully. The cardinal acknowledged that the reintegration of traditionalists into the structure of the Church might pose problems, but said that the example of the Brazilian Society of St. Jean Vianney, which was granted an apostolic administration by a papal directive of January 2002, might serve as a model. The cardinal added, however, that before any canonical solution can be proposed to restore ties with the SSPX, it will be necessary to resolve some doctrinal debates, particularly over the teachings of Vatican II. If those doctrinal issues can be resolved, Cardinal Medina Estevez said, a canonical solution could be "the establishment of an apostolic administration that would cover all Catholics attached to the old form of the Roman rite." As as NLM musicians know, the great struggle concerning liturgical music is the transition from the current miasma to the ideal. Our Schola has been working in this direction for 5 years, and the Gloria in Latin chant has so far not been an option for us. Pastors--liberal, conservative, or whatever--all express the same concern: the people will be under the impression that the Gloria has somehow been "taken away from them" and given to the specialists to sing. This issue is not easily dismissed as idiosyncratic. Yes, participation through silent prayer is real participation, but people do want to sing the Gloria. At the same time, the Latin is unfamiliar. No settings are commonly known (not even the Missa De Angelis). But the only way to get to know the text is to make it known through repetition. But pastors are concerned that during the period of pedagogy, people will have nothing to do during the Gloria. They will tune out. They are concerned that waiting six months to a year for people to get know it is too long. Thus were we challenged to find a Gloria that is in Latin but is antiphonal, that is to say, that has a few easy parts that people can sing on the very first Sunday that it is made available. Of course no such thing exists in the Gregorian repertoire, and for good reason. But do we therefore pass up the opportunity? No way. We settled on the Gloria XV, the Dominator Deus. It is simple and clean--very singable. We introduced to it two additional antiphons of "Gloria in Excelsis Deo"--in a way that would not disrupt the music. See what you think of the result: Gloria Dominator Deus. A corruption? We don't think so. In some ways, it provides an interesting look at the structure of the Gloria: three sections. As we work through it over the next six months, we will look for ways to eliminate the Antiphons, and we'll be left with the pure chant as the Church asks us to sing it. I'm curious about the reaction of readers. Remember that we are dealing with modern reality here, a sociological structure of parish life that is not accustomed to Latin and chant, one that does not lend itself to easy conversion to the ideal. We are thinking about the goal, and the hugely important issue of the transition, a transition that accommodates the concerns of both pastors and laity. 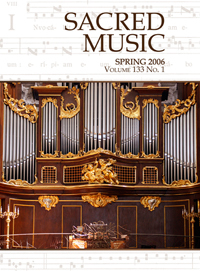 The Church Music Association of America has put the latest issue of Sacred Music (Volume 133.1) online, as this post explains. It features a piece by William Mahrt, the new editor. He explains how and why chant is the ideal form of liturgical music. He provides a close examination of a single liturgical text employed in three different uses in the Roman Rite and uses the structure of each melody to illustrate a theological point. The article will be a revelation for anyone who thinks of the liturgy as a text-only enterprise, or anyone who believes that the Roman Rite can be fully understood apart from its official chant books. The issue also contains articles on the Ward Method, William Byrd's "Ave Verum," and other essays and documents. The Cafeteria Is Closed has a piece "Another beautiful "Novus Ordo" celebration" which looks at a parish in Detroit, Michigan which seems to be well advanced in the first stage of the reform of the reform. Over at his blog, Fr. John Zuhlsdorf shares with us some stunning images from the modern Roman liturgy as offered at St. Agnes Church in St. Paul, Minnesota. It shows one particular aspect, or "stage one" as I like to think of it, of the Reform of the Reform movement. You see, the reform of the reform, I think, must be understood strategically. Strategically because it involves vast numbers of the faithful, many of whom are unformed or even de-formed. 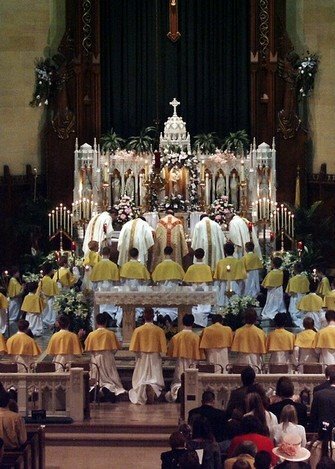 Many unaware of their own tradition and who haven't a real sense of Catholic liturgy. It isn't that they are necessarily apathetic; many just don't know. My experience has shown me that when many of them, particularly the young, do come to have some sense of our tradition, they have two responses: 1) they feel somewhat betrayed to not have been introduced to it, 2) they want to learn and experience it more. Still others need to be gradually "won over", having for the past few decades come to believe that the Church no longer deems it "right" to do things like use Latin in the liturgy, or say Mass ad orientem. Such fables about the Council and the post-conciliar liturgy are unfortunately even passed on by some of our parish priests -- perhaps because they too are ignorant in this regard. The faithful need to be re-adapted and re-sensitized to a more Catholic ethos in liturgical celebrations (such as we see at St. Agnes or the Oratory) and also shifted away from a sense of certain roles being a "right" and means of lay participation - e.g. EMHC's. That more Catholic sense found within a traditional liturgical ethos in turn helps re-orient the focus of the liturgy to Divine worship, and away from unbalanced or incorrect perspectives which can turn the liturgy inward on itself, not as an act of worship of God followed by our sanctification, but as an act of self-worship so to speak; the gathering of a community celebrating itself. While some of the more hardline traditionalist sorts have been critical of this, considering it shallow, those who think so must understand that the reform of the reform is itself a work in progress; one that will happen in stages. This first stage is crucial and necessary. After the Church brings us a better and more faithful English language translation of the modern Roman Missal most of our parishes use, and after she generally minimizes the presence of liturgical abuses in parishes -- abuses which have often fostered an incorrect or distorted approach to the sacred liturgy, and as the state of continuity with our tradition and conformance with Vatican II grows and spreads (helped along by the wide and generous presence of the classical liturgy) it is especially then that the even deeper work of reforming the post-conciliar reform can begin. In the case of St. Agnes', this Church, like the Brompton Oratory, they are examples of those parishes well advanced in "stage 1." I haven't any new information to provide you at present on the possible universal indult. However, with speculation out there on the part of a few that this was all a "smoke and mirrors" act, I wanted to share with NLM readers something that may be of encouragement -- and which is contrary to the skepticism that some have expressed. Mr Philip Lawler, the editor of Catholic World News, and I have been speaking recently. It is his impression, and also that of his best sources in Rome and elsewhere, that, based upon the evidence we do have and informed speculation, some kind of important liturgical document pertaining to the classical rite is likely in the works, and they continue to believe and expect something will be issued "soon" -- "soon" being open to interpretation of course. In short, the speculation is not baseless in their opinion either. I just wanted to share that with the NLM readership. I just thought I would share with everyone here pictures from the Solemn High Mass (1962 liturgical books) we had this afternoon for Easter Sunday at our FSSP apostolate here in London, Ontario. I figure I may as well post some "local" interest stuff at least now and again. Unfortunately the latter two pictures turned out a little grainy, but you get a sense anyway. I know that some believe that the universal indult story is now not going to come to pass. For some reason, some have taken far too much stock in the Maundy Thursday date as though it were that day or none. Hey, we all hoped it might be then, because after all, Maundy Thursday was only a few days away so who wouldn't hope that it might be that soon? But it wasn't Maundy Thursday. And let me tell you something else, as recently as today, I keep hearing from important people; people who aren't just swept up by rumours; people who do have contacts; people who are bridges between the reform of the reform and the classical rite; I hear from them that indeed, the Holy Father has made some kind of decision as to a course of action that is good for the classical liturgy, but we don't know precisely what it is, and that ultimately, it is only a matter of time before a document is published. Of course, a matter of time could mean days, or it could mean weeks, possibly even months. But that matter is far from dead, and it can't be written off. This blogger hasn't written about it these past few days, not because I've thought it somehow "dead and buried", but because it seemed highly unlikely that we'd hear about it come the evening of Holy Thursday and the beginning of the Triduum. But come tomorrow, this blogger will be back on the watch. If you still incline to believe the issue is dead, Rorate Caeli has as interesting piece up today, Allen and the "Consensus" Myth - A Chronology of Events This piece responds to the Allen article in NCR by looking at the chronology of events, beginning in the last half of 2005, and proceeding up to the present day. I'd highly recommend people look at this chronology. One thing should be clear, this talk about a universal indult is not unsubstantiated, nor the product of simply blogging rumours. It is based on real and promising signs coming from Rome. "And he saith unto them, why are ye fearful, O ye of little faith? Then he arose, and rebuked the winds and the sea; and there was a great calm." Let us have faith in the Holy Father (not to mentioned the Holy Spirit). Faith in what we know of him that he will act for the good of the Church, for the good of those attached to the classical liturgy, and for the good of the reform of the reform. Whatever your liturgical stripe, to all who read this blog, a blessed and joyous Easter to you and yours. In the comments section on one of the blog posts we've been discussing the question of the relationship of the classical Roman liturgy and the modern Roman liturgy (in the context of an eventual reform of the reform). It brings up an interesting point, and one which certainly will not be devoid of controversy and debate. I proposed the possibility, perhaps even the desireability (something I am not firmly convinced of or bound to I should note) of there being a permanent co-existence of the two missals -- I'll qualify this in a bit; the situation as its stands today must change. I used the expression of "two Roman rites" which was an idea which came up in the Fontgombault liturgical conference held in 2003 and hosted by Cardinal Ratzinger. That conference sought to bring together reform-of-the-reformers and those of the classical liturgical communities in an attempt, I think, to build consensus and alliances. (These conferences were published by St. Michael's Abbey Press under the title of Looking Again at the Question of the Liturgy with Cardinal Ratzinger). At my suggestion, this spurred some discussion by some of our faithful readers about the possibility, or impossibility of "two Roman rites". Historically of course, there has been one Roman rite, and there have been "uses" or variants on the Roman rite. The distinction between a "rite" and a "use" is a technical one, but it is a legitimate distinction. Ultimately, my main point of interest isn't so much in the question of rite vs. use, but rather the future of both Roman missals: whether both can indefintely co-exist and develop, or whether this should only be a temporary situation that ultimately leads back to one united Roman missal -- a missal that rectifies the rupture in the organic development of the liturgy. Historically, the idea of a multiplicity of rites and uses is, of course, not new. Today we are faced with a situation in the Roman rite whereby we have two missals in use. Whatever the status of the missals now (normative vs. indult, etc.) they do have a life of their own. The 1970 Missal is of course the most widely used Missal in the Catholic Church in the Latin rite and as such is considered the normative missal. On the other side we have the classical liturgical books which have now come to have entire parishes, religious orders, monasteries, priestly societies, seminaries and lay institutes associated with them. And so the question then is how will things develop over time? Will they be re-united or will they co-exist somehow as defined by the Church? It's an interesting question and one I'm not convinced there is an absolute answer for since it isn't a dogmatic question. As Fr. Kocik and others have excellently noted, we're in a situation right now where, at least some of us, including the likes of (then) Cardinal Ratzinger, Fr. Jonathan Robinson, Fr. Kocik himself, etc., believe there is a need for both the reform of the reform and a truly "wide and generous" application of the classical liturgy. A big part of this is because the latter can help the former. But the question is, as we pursue the reform of the reform on the one hand, and as we pursue the classical liturgy on the other (exercising the very fullest and best of that tradition and not it's less ideal applications prior to the Council), where we will be in a few decades? At the heart of this issue is a pastoral question. During this time, there will be people, people with children, as well as priests, monks and nuns, whom will have grown up with one of these missals; who for, for them, this or that missal is their liturgical home. Surely that complicates the question? As well, the Church, with the painful memory of the schisms that happened after the Council, will desperately want to avoid this again as far as is humanly possible. Now let me qualify. In speaking of the classical liturgical books, I'm not suggesting that this in the context as it stands today whereby the 62 Missal is frozen at the point it was at in 1962. If what I am proposing is even a possibility to come to pass, then it cannot stay frozen; rather it must undergo some kind of organic development a la the letter of Sacrosanctum Concilium and in that hermeneutics of continuity Pope Benedict has spoken of. This, too, is up to the Church. As to when that happens, this too is a pastoral question. The Church wishes to heal schisms, and wishes to be pastorally sensitive to the understandable reluctance we presently see to change to those liturgical books, but this can't be so forever. Likewise, in regards the modern Roman liturgy, change cannot happen overnight. Perhaps we will first see the return of some Latin, alongside a better, more faithful and beautiful translation of the vernacular text. Hopefully we shall see a return of our tradition of chant and polyphony, as well the development of new variants on those musical traditions which grow organically from the old forms. Perhaps the addition of English forms of chant, perhaps variations on it which are evidently sacred and linked to our inheritance. After this, hopefully we shall see things move deeper, looking at the very missal itself, its rubrics, its options, its prayers, and examining how it might be brought back into a more organic relationship to the 1962/1965 that preceded it. Presuming such development occurs, as we have two different starting points, and pastoral considerations to take into account on both sides, for some time we may still have two fairly unique sets of missals and liturgical traditions. Besides the missal itself, we have things such as the difference in the minor and major orders for example; the structure of the liturgical seasons and calendar, some different disciplines. Some of these differences are likely to be minimized or eliminated as the reform of the reform proceeds, as well as the organic development of the classical liturgy, but others may well remain differences. Ultimately it is the Church who will decide what will go where, but where will things be, say, in another 40 years? An interesting question. It is very hard to say. As Fr. Kocik said, certainly we want to lessen the gap between the modern Roman missal and the 1962 liturgical books, but in the end we may be facing a scenario whereby both liturgies will still be unique (not in a bad way) depending upon how the Church has both proceed in the next decades. Of course, this is all very speculative and abstract. But I would suggest that it is possible that, given how we have had a tradition of uses and multiple rites, given the potential pastoral considerations that may be faced, and given that this is not necessarily set in stone, the Church could determine it pastorally best to have these two variants co-exist somehow. Which, however, is more ideal and how do each of you speculate thing may go in these regards? Let's discuss. I'd be quite interested in hearing the perspective of some Eastern Christians on this. A couple of people have emailed me an opinion piece in the National Catholic Reporter which is effectively (though not absolutely) denying the existence of a motu proprio. At this point we have Mr. Allen's Vatican sources saying one thing but we also have the other Vatican sources who have been quoted saying the opposite. So whose sources are the more credible? The fact that we can find nay-sayers at the Vatican isn't a great surprise. Let's face it, this issue would have many in strong support, and many in strong opposition. That aside, clearly there was enough credibility in Vatican sources reporting about this actual or potential motu proprio that these rumours weren't simply appearing on the "Catholic blogosphere" but also appeared in news services like CNA and others -- and to my remembrance they appeared there before they appeared on the blogs (though I'm not absolutely sure of the order). That does say something. "Given the way Benedict XVI has played his cards close to the chest on other matters, it's possible that a document is in the works without most of his key advisors knowing about it." He is right about such a possibility of course; after all, not all Vatican sources are necessarily inside the loop on this issue or others. Therefore, I would question why Mr. Allen would say "most of his key advisors" given that he has only quoted two sources and we have, potentially, as many saying the opposite. I also do not think it is necessarily a safe assumption to make that the Pope might not, for the good of the potential reunion of the SSPX, make a move without the majority assent of the cardinals. The Pope is a sensitive man, but also keenly aware of some of the problems within the Church and the particular persecution faced by those attached to the classical rite. He surely won't start a revolution, but I do not necessarily think he will simply acquiesce to those attitudes either. Moreover, it also depends on the nature of the decree. Some have mused that perhaps the decree will simply be a clarifying statement about the current canonical status of the classical rite -- as somehow not "abolished" by the Pauline liturgy. I'm not certain how plausible that is or is not (not being a canonist; though I've always assumed it was replaced contrary to some traditionalist claims) but, for the sake of using it as an example if that were to be the case, then the opinions of the Cardinals would have no ultimate bearing on this. And so we are left precisely where we started. Waiting, praying, hoping -- and with good reason. Incidentally, remember all the contradictory ideas floating about before the recent Vatican instruction about homosexual men and the priesthood? Let us keep close to our hearts and minds this great mystery we particularly remember during this Triduum, re-presented at each Holy Mass in an unbloody manner. According to a March 20 report by Catholic News Agency (www.cna.com), citing an unnamed Vatican source, the commission will approve “a proposal and a plan for liturgical reform” in the Apostolic Exhortation that the Holy Father expected to be released by October 2006. CNA’s “Vatican source” said that the exhortation would include an invitation to greater use of Latin in the daily prayer of the Church and in the Mass -- with the exception of the Liturgy of the Word -- as well as in large public and international Masses. It would also encourage a greater use of Gregorian chant and classical polyphonic music, the CNA report said, the gradual elimination of the use of songs whose music or lyrics are secular in origin, as well as the elimination of instruments that are “inadequate for liturgical use”. The story said that the pope is expected to call for “more decorum and liturgical sobriety in the celebration of the Eucharist, excluding dance and, as much as possible, applause”. Join Fr. Joseph Fessio, S.J., as he will be giving four conferences on Cardinal Ratzinger’s book, “The Spirit of the Liturgy.” Inspired by the Cardinal’s own thoughts and words, Fr. Fessio will provide a basic theological formation in the liturgy to assist Christ’s faithful to enter more deeply into the sacred mysteries of the Holy Mass. Fr. Fessio was a doctoral student of the now Pope Benedict XVI and is Provost of Ave Maria University and Founder of Ignatius Press. Space is limited, register today. Visit www.CatholicRC.org to view flyer and obtain registration information. Not shockingly (and let's be honest about that!) we didn't hear any announcement today about a motu proprio clarifying the place of the classical liturgy in the life of the Roman church today. For myself, this isn't a big surprise, because the date has be entirely the most speculative part of this whole matter. A few (and only a very few thankfully) aren't reacting to this very well, presuming the worst. I disagree with that kind of response. Not only do I think it premature, I think it in the end will be proven wrong, because I believe there is substance to what we've been watching and waiting for. Indeed, there have been other rumours, about this and other things. But it has not been like this before. Never have we had such reason to hope. Never. Take hope in that. The fact of the matter is, we know there is movement and discussion at the highest levels pertaining to the SSPX question. Tied to that is the question of the classical liturgy and the non-SSPX communities by consequence -- things which our Pope is a friend of and personally quite fond of. We've seen movement in the Ecclesia Dei commission and we've seen the meetings of the Pope and the Curia where this question has come up and in depth. Much of this we've seen in the past week alone, and the more of the same since mid February. From that, we've got the rumours of a motu proprio. Rumours coming from good sources, including Roman sources. Rumours big enough and plausible enough to make it to big Catholic news providers like the CNA and CWnews, as well as other non-English language sources. We must be realistic about this. We have extremely good reason to believe that the Holy Father is going to do something to broaden/clarify the role of the classical liturgy in the life of the Church. We have more signs of that than we ever had, and the known and confirmed meetings have been more intensive than they ever have been before. What we don't know, however, is the time. We never have. It is the time which, as I say, has been the most speculative and without basis. Keep in mind that what has been said to be "certain" or "almost certain" is the motu proprio exists; no one ever claimed to know when it would be made public however. They've only speculated. That speculation has ranged, but part of it is that it may come during the Triduum. So let's not determine that because it wasn't released on the very first and closest time that it may have been released, that thus it's not going to happen. Most of us aren't thinking that way. Even if the Triduum passes us by without an announcement, that wouldnt be a momentous surprise. We've heard different rumoured days. Today. Easter Sunday. The anniversary of the papal election. The Feast of St. Pius V. It could be any of those days, or it could be none of them and pop up a day of seeming insignificance for all we know. I can't say anything for certain of course. All I can say is that I believe something, some kind of decree is coming sometime, hopefully sometime this month, that will bode well for the classical Roman liturgy, and I think we have reason to believe it could happen "soon". As we prepare to enter into the holiest of holy seasons, the Easter Triduum, and as we wait in anticipation on news pertaining to the sacred liturgy of the Roman church, the classical and the reform of the reform, let us pray. Let us pray that both of these initiatives, whether we find our home more in one than the other, or whether we find ourselves home in both, would be spurred on and advanced in leaps and bounds by our Holy Father, and by all of our shepherds and pastors, and that a new openness will pervade. 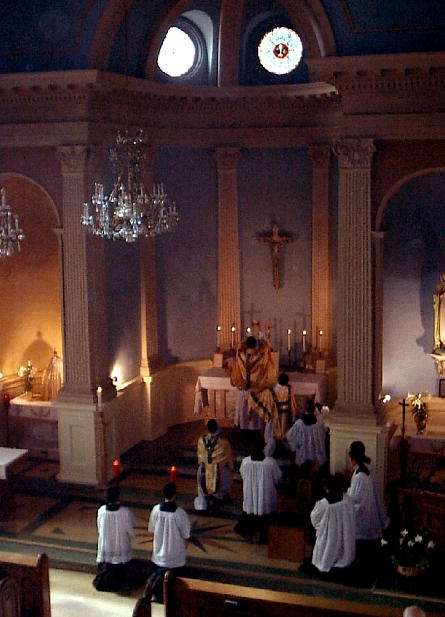 Let us pray that a motu proprio will be issued soon and that from it many graces will flow and the Roman liturgy would be truly renewed and restored, celebrated with excellence and reverence, and that our venerable and ancient traditions, our inheritance and heritage, would again be given pride of place in our parishes and celebrated with vigour and excellence. It is hard to tell for certain if this is "new" or different from what we are already hearing. However, use of the word "certain" is, again, making things all the more concrete. ROMA, April 12, 2006 – In Saint Peter’s basilica in Rome, Benedict XVI is celebrating his first Holy Week as pope. Meanwhile, in another ancient and grandiose basilica, that of Monreale in Sicily, the Paschal rites find a “guide” very close to him in point of view: Romano Guardini, the German theologian from whom the young Joseph Ratzinger learned the most in the area of liturgy. The present archbishop of Monreale, Cataldo Naro, took up the original German version of Guardini’s account, translated it, and provided it for the faithful within a pastoral letter with the title “Let Us Love Our Church.” It is like a guide for today’s liturgical celebrations. In the text, the great German theologian wrote of all his amazement at the beauty of the Monreale basilica and the splendor of its mosaics. But above all, he wrote of how impressed he was with the faithful who attended the rites, and their “living-in-the-gaze,” with the “compenetration” of these people and the figures in the mosaics, which draw life and movement from the assembly. The basilica of Monreale, a masterpiece of twelfth century Norman art, has its walls completely covered with gold-enameled mosaics depicting the stories of the Old and New Testaments, angels and saints, prophets and apostles, bishops and kings, and the Christ “Pantocrator,” ruler of all, who from the apse enfolds the Christian people in his light, his gaze, his power. Here follows a translation of Guardini’s account of his visit to Monreale, excerpted from his “Reise nach Sizilien [Voyage in Sicily]”. The German original is in Romano Guardini, “Spiegel und Gleichnis. Bilder und Gedanken [Mirror and Parable: Images and Thoughts]”, Grünewald-Schöningh, Mainz-Paderbon, 1990, pp. 158-161. Today I saw something grandiose: Monreale. I am full of gratitude for its existence. The day was rainy. When we arrived there – it was Holy Thursday – the solemn Mass had proceeded beyond the consecration. For the blessing of the holy oils, the archbishop was seated beneath the triumphal arch of the choir. The ample space was crowded. Everywhere people were sitting in their places, silently watching. What should I say about the splendor of this place? At first, the visitor’s glance sees a basilica of harmonious proportions. Then it perceives a movement within its structure, which is enriched with something new, a desire for transcendence that moves through it to the point of passing beyond it; but all of this culminates in that splendid luminosity. So, a brief historical moment. It did not last long, but was supplanted by something else entirely. But this moment, although brief, was of an ineffable beauty. There was gold all over the walls. Figures rose above figures, in all of the vaults and in all of the arches. They stood out from the golden background as though from a star-studded sky. Everywhere radiant colors were swimming in the gold. Yet the light was attenuated. The gold slept, and all the colors slept. They could be seen there, waiting. And what their splendor would be like if it shone forth! Only here and there did a border gleam, and an aura of muted light trailed along the blue mantle of the figure of Christ in the apse. When they brought the holy oils to the sanctuary, and the procession, accompanied by the insistent melody of an ancient hymn, wound through that throng of figures, the basilica sprang back to life. Its forms began to move. Responding to the solemn procession and the movement of vestments and colors along the walls and through the arches, the spaces began to move. The spaces came forward to meet the listening ear and the eye rapt in contemplation. The crowd sat and watched. The women were wearing veils. The colors of their garments and shawls were waiting for the sun to make them shine again. The men’s faces were distinguished and handsome. Almost no one was reading. All were living in the gaze, all engaged in contemplation. Then it it became clear to me what the foundation of real liturgical piety is: the capacity to find the “sacred” within the image and its dynamism. Monreale, Holy Saturday. When we arrived, the sacred ceremony had come to the blessing of the Paschal candle. Immediately afterward, the deacon solemnly advanced along the principal nave, bearing the Lumen Christi. The Exultet was sung in front of the main altar. The bishop was seated to the right of the altar, on an elevated throne made of stone, where he sat listening. After the Exultet came the readings from the prophets, and I rediscovered the sublime significance of those mosaic images. Then there was the blessing of the baptismal water in the middle of the church. All the assistants were seated around the font, with the bishop in the center and the people standing around them. The babies were brought forward – one could see the emotion and pride in their parents – and the bishop baptized them. Everything was so familiar. The people’s conduct was simultaneously detached and devout, and when anyone spoke to another person standing nearby, it was not a disturbance. And so the sacred ceremony continued on its way. It moved through almost every part of that great church: now it took place in the choir, now in the nave, now under the triumphal arch. The spaciousness and majesty of the place embraced every movement and every figure, commingling them and uniting them together. Every now and then a ray of sunlight pierced through the vault, and a golden smile spread across the space above. And anywhere a subdued color lay in wait on a vestment or veil, it was reawakened by the gold that spread to every corner, revealed in its true power and caught up in an harmonious and intricate design that filled the heart with happiness. The most beautiful thing was the people. The women with their veils, the men with their cloaks around their shoulders. Everywhere could be seen distinguished faces and a serene bearing. Almost no one was reading, almost no one stooped over in private prayer. Everyone was watching. The sacred ceremony lasted for more than four hours, but the participation was always lively. There are different means of prayerful participation. One is realized by listening, speaking, gesturing. But the other takes place through watching. The first way is a good one, and we northern Europeans know no other. But we have lost something that was still there at Monreale: the capacity for living-in-the-gaze, for resting in the act of seeing, for welcoming the sacred in the form and event, by contemplating them. I was about to leave, when suddenly I found all of those eyes turned toward me. Almost frightened, I looked away, as if I were embarrassed at peering into those eyes that had been gazing upon the altar. "Several sources confirm that tomorrow, Holy Thursday, an important Papal document should be released, having as its subject the current validity of the Tridentine liturgy. This document --in the form of a Motu Proprio, it is said -- has already been signed and would simply be officially promulgated. Very recent Papal audiences with Cardinal Arinze allow [us] to reasonably suppose that the date of publication shall be precisely tomorrow." Quote of the week: "The silence from Rome is getting downright noisy"; CWN editorial on the "Universal Indult Watch"
The rumor mills have provided dozens of reports that Pope Benedict will soon issue a document regarding the Latin Mass. But the stories are invariably laced with words like 'could' and 'perhaps.' There has been no confirmation from the Vatican, nor any denial. My own prediction-- based on hints and inferences and hunches, nothing more-- is that the document will be at least as strong as a universal indult, but will not resolve the canonical status of the Society of St. Pius X. Again that is a prediction, not a report. When will this document appear: on Holy Thursday? Easter Sunday? the anniversary of the Pope's election (April 19)? I don't know. Anyone who does know isn't telling. If and when CWN receives enough solid information about the document-- its existence, its content, or its timing-- we'll post the news promptly. Until that time we're bowing out of the speculation. Feria V, in Cena Domini? The (good) tension is certain evident as people await news. I can only presume Rocco Palmo is wondering about some decree on the classical liturgy. This is the same story I posted about yesterday from Catholic News Agency. This gives confirmation of that story, but won't give you anything you haven't seen already on here. I link to it solely for the purpose of making it official on this blog. For those of you interested in Marini, Zenit has an article on him from yesterday. I chose not to post it until today, however, as I wanted to focus on the CNA story. I will quote it below. VATICAN CITY, APRIL 10, 2006 (Zenit.org).- In a new Italian-language book, the master of pontifical liturgical celebrations reveals some of the novelties introduced in papal rites since the Second Vatican Council. Archbishop Piero Marini states in "Liturgia y bellezza. Nobilis pulchritudo" (Vatican Publishing House) that in recent years, in keeping with the conciliar spirit, some specific rites have been updated. Among those updated are the consistory for saints, the consistory for the elevation of new cardinals, the rites of beatification and canonization, and the rite of the conferring of the pallium on archbishops. "Some improvements can still be made, but as a whole these rites now respond to the principle of noble simplicity," says the master of ceremonies. By way of example, he mentions the rite of the consistory for the elevation of new cardinals. At the start of the 1990s, it established three steps: the secret consistory in the Consistory Hall in which, after the master of celebrations' "extra omnes," the Pope had to say officially the names of the new cardinals, already known one month before; then, in the same hall, a semi-public consistory; and, finally, a public consistory in Paul VI Hall. "Following the update, the ritual sequence unfolds in just one celebration centered on the Word of God," Archbishop Marini explains. In regard to some updated papal celebrations, the prelate points out, for example, the novelty of Holy Thursday: in the Chrism Mass, the oils are carried by catechumens, sick people, candidates for confirmation, and deacons preparing for the priesthood. In the celebration on Easter Sunday, he writes, "the former rite of the 'Resurrexit' has been recovered and is now called 'Peter witness of the Resurrection,' and, since the year 2000, the former rite of the Pope's testimony before the icon of the Savior [...] is now part of the rites of the papal liturgy." Other novelties are implemented, for example, in the Vigil of Pentecost: After the homily, the so-called Memoria of the sacrament of confirmation has been included. Archbishop Marini, 64, says that the celebration of the papal liturgy is not always easy in areas that do not have the necessary elements. He notes, for example, "in the last decades, many celebrations have taken place in St. Peter's Square. Such places present not a few difficulties for the collation of the fixed elements established by the liturgy." Moreover, he indicates, "in the basilicas of St. John Lateran and St. Paul the ambo is missing, and in St. Mary Major and St. Peter, in addition to the ambo, the Chair is also missing." Tests have been carried out to surmount these problems in St. Peter's, but for the time being no solution has been found, the archbishop continues. In the first part of the book, Archbishop Marini assesses the implementation of Vatican II's renewal, especially the introduction of the constitution "Sacrosanctum Concilium." In the second part, he addresses the relationship between beauty and liturgy, primarily in reference to papal liturgical celebrations. An important part of the volume explains the meaning of the papal insignias such as the tiara, the miter and the pallium. Every chapter is preceded by images of the ring of the Fisherman, furnished by the Vatican Apostolic Library. "This image recalls the activity of the Bishop of Rome, called to preside in love over the universal Church," Archbishop Marini writes. "In particular, the effort of the Fisherman of Galilee, reproduced in the five images of different Popes, recalls the tireless commitment, especially of the last Popes, to the liturgy." He observes in the book: "I keep indelibly the memory of the service rendered during Paul VI's pontificate in the creative years of the liturgical reform from 1965 to 1975. I cherish the memory of the celebrations and trips shared with John Paul II in Italy and the world. Finally, very alive is the emotion at the beginning of Benedict XVI's petrine ministry." The archbishop states that the book's intention is that the reader should discover that "the liturgy requires that we give it the most beautiful setting and the best time" so that "words and gestures become the voice of the Spirit who speaks to us of God." Vatican, Apr. 10 (CWNews.com) - Pope Benedict XVI (bio - news) has named three new members to the Ecclesia Dei commission, which oversees pastoral outreach to traditionalist Catholics. The April 8 announcement of the new appointments came at a time of intense speculation that Pope Benedict XVI will soon release a document broadening permission for priests to celebrate the Latin Mass. " Alright, here's the long awaited update. It turns out not to be absolute confirmation, but it is getting closer. I had heard of a tidbit which seemed to suggest some kind of written confirmation of decisions about this whole matter. As it turns out, it is still at the rumour phase, however, it does seem to come from a reputable source (Catholic News Agency) and in a way that is suggesting this is basically a done deal from the Pope's perspective -- of course, until we hear the Pope say it, it still, unfortunately, can only be called rumour and not fact. I finally found this "tidbit" on this blog from Australia. I tried to confirm the CNA story, but their site is presently down -- and actually, it has been all day, but for the early morning. A source at the Vatican has told CNA that during Holy Week Pope Benedict XVI may grant universal permission to use the Missal of St. Pius V, the liturgical rite used in the Church before Vatican II. According to the source, the announcement could come “between Holy Thursday and Easter Sunday,” but the exact day has not yet been set. Nevertheless, the source said the decision has already been made by the Holy Father and that it’s “only a matter of time” before it is publicly announced. “A minor official gesture by the Holy Father would be enough to allow the Mass according to the 1962 Missal to celebrated by whoever desires to do so, thus reiterating that this rite is still valid today simply because it was not abolished,” the source told CNA. The announcement would be in the context of “the reform of the reform” that Pope Benedict XVI is promoting, which includes norms and principles that will be made public in the upcoming post-synod Apostolic Exhortation on the Eucharist. At the same time, such a gesture by the Pope could contribute to ending the schism with the Priestly Fraternity of St. Pius X, founded by Archbishop Marcel Lefebvre in 1988. On Saturday, Pope Benedict XVI named three new members to the Ecclesia Dei Commission, created by Pope John Paul II in order to reach out to the Lefebvrists. They are Cardinal William Levada, prefect of the Congregation for the Doctrine of the Faith, Cardinal Jean-Pierre Richard, Archbishop of Bordeaux of president of the Bishops’ Conference of France, and Cardinal Antonio Cañizares Llovera of Toledo, Spain. [Incidentally, this appears to be what Antonio was also referring to in the NLM comments section, but in Spanish. Second, possibly related to this whole matter as pertains to the SSPX, the Holy Father met with the Prefect of the Congregation for Bishops today according to Vatican Information Service. "Bishop Trautman strongly criticizes proposed Mass translations; 'incarnate,' he says, is 'not intelligible to the vast majority of those in the assembly'; on translating 'praeclarum calicem' as 'precious chalice': 'Should the agenda of a sacred vocabulary, no matter how well-intentioned, be allowed to circumvent the inspired word?' (Diocese of Erie)"